Ages 8 through 17. This set includes 14 books!. The 14 books in this series include reproducible worksheet activities to strengthen basic skills that are critical for success in the classroom curriculum. 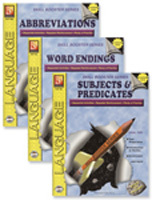 Each book focuses on one of the following topics: Subjects and Predicates - Four Kinds of Sentences - Contractions - Plurals and Possessives - Word Endings - Antonyms - Synonyms - Homonyms - Abbreviations - Compounds - Syllables - Prefixes - Suffixes - Clipped Words .